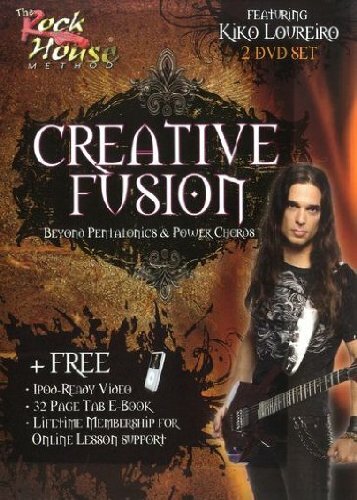 Move beyond power chords and pentatonics and open up your musical universe! Kiko Loureiro's roots in Brazilian, Latin, Fusion, Jazz, Metal and Classical music influence his masterful compositions and stlye. In this program, Kiko shows you a method for using arpeggios to craft amazing leads and melodies. He starts with major and minor arpeggios and triad voicings and builds them into progressions. Then expands on this concept with major arpeggio extensions adding the 7th and 9th and shows how to complete the mission by delivering full dominant and diminished arpeggios in single and cross string technique. Kiko explains and demonstrates how these all relate as tools for creating your own unique musical style. Learn modal arpeggios and how to apply them over full band backing tracks so you can start creating your own masterpieces! Zone 0 - play on any DVD system in the world. Ipod-ready video. Each Rock House product includes free lifetime membership to Rock House's online lesson support system. Enhance your learning experience, links with instructors, download backing tracks, access message boards, and much more. You'll connect with a community of musicians around the world learning to play music using The Rock House Method.